Radiology will enter a new era of reimbursement as implementation of the Affordable Care Act moves forward. No one knows how long the transition will take or exactly how it will unfold, but federal health care reimbursement will move from fee-for-service (FFS) medicine toward some sort of outcomes-based model in the now-forming accountable care organizations (ACOs). Measuring quality and how it plays into reimbursement will define the economic rules of the game, which radiologists and hospitals need to know. After decades of radiology operating in a volume-driven FFS system as a major revenue center, a move to outcomes-based reimbursement represents a major change. Reimbursement always is an attention-grabbing topic, and it’s a major SIIM issue because informatics may provide a way to prove that value, according to Weiss, an associate professor in the radiology department at the Virginia Tech Carilion School of Medicine and Research Institute. Informatics could help radiology measure and document what it brings to the table in health care, Weiss told the audience. But radiologists and hospitals still face the problem of hitting a quality target that has not yet been defined by the Centers for Medicare & Medicaid Services. Until Washington defines quality, radiologists and hospitals can make only educated guesses. Several speakers at SIIM said that until there is a quality definition, these groups really can focus only on efficiency, which will benefit them in virtually any scenario. Hospitals and radiology groups utilize various quality assurance reviews and strategies, but they’re not directly linked to reimbursement or standardized across the industry. Mammography is one clear exception, with the Mammography Quality Standards Act and Program regulating screening and diagnostic exams. Programs such as the Physician Quality Reporting System, which includes imaging-related metrics such as fluoroscopy time, the percentage of asymptomatic patients at various cardiac disease risk levels receiving imaging exams, and the percentage of mammogram patients entered into follow-up reminder systems, may provide data to help develop standards, but that program hasn’t yet reached that point. Finding ways to measure and prove quality may be a key component of winning contracts in years to come. While it’s unknown exactly what form it will take, expect it to play a larger role in imaging success. Proving quality outcomes may be less straightforward in radiology than, say, cataract surgery, where visual acuity, infection, and other complications provide more clear, measurable outcomes. While the quality target and its implementation remain unclear, imaging organizations would be smart to think about how they can prove quality, especially to forming ACOs. Paul Nagy, MD, jokingly called it the “law of inverse participation.” It states that the fewer people who show up for a system demonstration, the more people will storm your office with pitchforks and torches when they don’t like the system selected. In a session at SIIM, Nagy discussed the tactics Johns Hopkins Hospital used to draw hundreds of physician demo participants—and correspondingly reduce pitchforkers—to evaluate an enterprise image viewer for the Baltimore health system. Nagy said involving the right number and mix of participants offers the best balance in evaluating and selecting a new technology. To provide workable demonstrations, the Hopkins IT team winnowed the list of candidate systems from 12 to three and then set up a 15-minute, Web-based, self-paced, task-oriented demo for physicians. To further entice participation, all demo participants were entered in a raffle featuring iPads as prizes. The strategy yielded more than 300 physician participants from across the hospital system, giving the IT team a wide sample of how the viewers would serve various users. “We told them, ‘We want you to decide. The radiologists aren’t going to tell you what viewer to use,’” Nagy said. The broad participation avoided having the selection made by relatively few physicians with strong personal interests in computers, according to Nagy. He warned that tech-savvy physicians tend to focus on a product’s high-end features and capabilities rather than the day-to-day routine functionality being evaluated for broad use. Mobile applications were a common discussion at SIIM. The big question among clinicians was how might tablets, smartphones, or other devices help their practice. Among the IT professionals, the question was primarily, how do hospitals handle security and management of portable devices? Marc D. Kohli, MD, a radiologist at Indiana University Medical Center, noted that clinicians are driving mobile device use in most health care settings. Radiologists overwhelmingly do their work at the PACS workstations, while tablet devices are used most to show images to patients or as physician education tools. 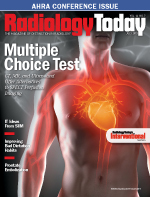 Kohli expects an increase in educational uses of tablets because they can store and display plenty of images and book material in usable formats, but he doesn’t see them having a large role as a clinical tool for radiologists. But from an IT perspective, the expanded use of tablets and other mobile devices creates security problems. Hospitals and other organizations need to work out the details of managing and securing personal devices used to access hospital data. Bring-your-own-device arrangements are common because facilities are not eager to purchase large numbers of devices for their staff. One important security consideration is a two-pronged authentication process where a user must register his or her specific device with the organization and also have appropriate password protection to access data. Kohli said one shift in the security thinking regarding mobile devices is a new focus on setting up systems to protect data rather than securing specific devices or workstations, which commonly has been the security approach in the dedicated workspace environment. C. Matthew Hawkins, MD, a radiologist and pediatric fellow at Cincinnati Children’s Hospital Medical Center, pointed out that patients will demand mobile device access for certain health care services as a means of making it easier to access the health care system. That said, he doesn’t foresee radiology images being one of the big drivers because there’s not much a patient really can do with a cell phone image. Hawkins mentioned in his presentation that 56% of American adults own a smartphone and that the devices are popular across most age and socioeconomic groups. He said 40% of low-income Americans use phones as their primary way to access the Internet, as do 45% of blacks, 42% of Hispanics, and 45% of young people. He added that 77% of mobile Google searches are done from home or work, not on the move. “It’s becoming the mainstream way that we access technology,” Hawkins said. While mobile devices may not be an imaging patient tool, your facility will probably benefit from allowing patients to use them for certain interactions within the health care system.